My day lilies are in bloom. I’ve had these for years and no one has ever been able to identify the variety – any takers? Have a great weekend and Happy Memorial Day! See you on Tuesday. 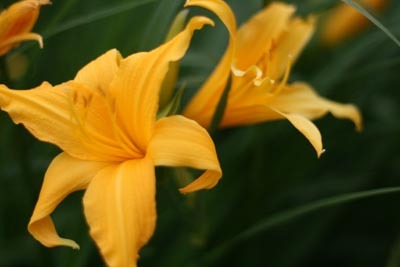 We were thinking Hemerocallis flava, but it’s described as lemon yellow and yours is not. Back to the google drawing board. The one you gave me is blooming too! Love it! No lilies here as yet. Yours is so pretty and sunny looking! Have a fabulous weekend. What a pretty color! No lilies here yet either, but soon. Those are beautiful lilies. Mine aren’t blooming yet. NO lilies for me, too cold still. See you tomorrow! They look a lot like my Stella D’Oro lilies. The first one of mine just opened yesterday. I don’t know one lily from another, but those sure are pretty! I have no idea of the variety. Those pop out in July for us. Thanks for the preview!! Definitely NOT Stella d’Oro – those have much fatter petals. Maybe Orange Monarch? Wow, so early! It’s like you’re in a different weather zone or something. Mine won’t bloom until July. absolutely lovely. Have a grand weekend. No clue. I don’t do day lilies, but they are lovely. Those are lovely! And I always thought I hated day lilies. A happy weekend to you too. They’re beautiful, I love daylilies. They look my Stella D’oros, which bloom on and off all summer long. Mine haven’t started to bloom yet. Did you know the flowers are edible? They taste a little like cucumber. Gorgeous! No idea what they are, though. I’m not good with flowers. I’m not enough of a hemerocalliphile to be able to tell you, but I love the classic lily-shaped ones. Is there a chance of seeing you at Cummington tomorrow? If I get out of work at a reasonable hour, I think we’ll be trying to make the trip down. I have been searching everywhere for an answer to my question – maybe you guys can help. I transplanted Stella D’Oro daylillies about 6 years ago – and they took the change very well and bloomed beautifully year after year, until last year. I got very large and healthy greens but not a single flower on any of them. This year looks the same so far. Do they need any special food? Is there anything else I can do? Thanks! No clue! But I hope you have a great weekend!